Is Judaic Christianity The Woman That Rides The Beast? The pagan traditions of Easter. Where does the circle start? 7000 YEAR HISTORY OF MAN. THE FALL OF ADAM AND EVE. Please ignore the links above and below this page by tripod. They are on every page because I do not pay for the web space and one of the conditions is that tripod the web hosts can put up their own advertising. Many of them contradict what this website is about. Thank You. Free Bible study software for Windows. e-Sword is feature rich and user friendly. Prepare great sermons and awesome Bible studies. Click here for a excellent bible study on the Mazzeroth. The above link is on going process of decoding the chronological calendar in the scriptures from Genesis to Revelation from the seven major feasts of Leviticus to the 6000 years of the history of man from his fall Gen:3 to his redemption by the blood of Yeshua/Jesus as the sacrificial lamb in the feast of Passover to Yeshuas’/Jesus’ return to rule as the lion of Judah in the 1000 year millennium rule as LORD and KING and God. I research into the reason for the 360 day calendar year of the scriptures and trace this back to the calendar system found in the book of the heavenly luminaries in the book of Enoch and the book of Jubilees. I try to unveil the fact how these books speak on the same level as scripture...and the reasons why God separated them from the 66 books of the bible. If you click on the above link go to the colour boxes in order from six days of creation to the left across to the one thousand year reign of Christ to the far right. 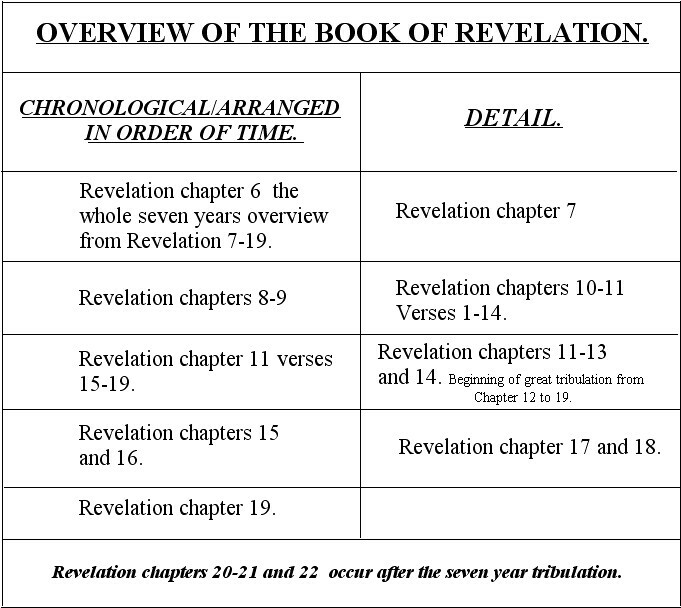 They will take you through Genesis to Revelation in chronological order using eleven detailed charts. Each chart again contains hidden links in the bible references and to articles that either myself has written or to articles on the net that will expand that particular events in time. Use these as a guideline and foundational only as a tool to expand your understanding of the full word and plan of God revealed through the scriptures Acts 20:27. The charts are divided in to eleven parts and are colour coded in chronological order. If you right click on the charts and save as onto your desktops you can save them as an image/Giff eliminating the adverts on the site. Part1 Part2. Part3. Part4. Part5. Part6. Part7. Part8. Part9. Part10. Part11. Click here to take you to web page where all eleven parts are linked in chronological order within the colour boxes. The tenth part portrays a pre tribulation catching away which I do agree with however there are seven catching aways that the scriptures speak through the seven harvests and I hope to add all of these in the future. For now this is a very good tool which expands our understanding of the full plan/council and will of God throughout the bible in which today we are so blessed to have in full from Genesis to Revelation. History pre written in eternity the beginning and the end Alpha/Aleph and Omega/Tav. But, beloved, be not ignorant of this one thing, that one day is with the Lord as a thousand years, and a thousand years as one day. 2Peter 3:8. For a thousand years in thy sight are but as yesterday when it is past, and as a watch in the night. Book of Psalms 90:4. The above scriptures are describing God’s position outside of time and space and many have said that this is evidence of the seven thousand years in error. The following verses are from Jewish books outside of the sixty six books of the bible showing that Jewish tradition depicts seven thousand years from beginning to end. And I appointed the eighth day also, that the eighth day should be the first-created after my work, and that the first seven revolve in the form of the seventh thousand, and that at the beginning of the eighth thousand there should be a time of not-counting, endless, with neither years nor months nor weeks nor days nor hours. Book of the secrets of Enoch 33:1-2. Moreover concerning the Sabbath likewise it is written in the Ten Words, in which He spake to Moses face to face on Mount Sinai; And ye shall hallow the Sabbath of the Lord with pure hands and with a pure heart. And in another place He saith; If my sons observe the Sabbath then I will bestow My mercy upon them. Of the Sabbath He speaketh in the beginning of the creation; And God made the works of His hands in six days, and He ended on the seventh day, and rested on it, and He hallowed it. Give heed, children, what this meaneth; He ended in six days. He meaneth this, that in six thousand years the Lord shall bring all things to an end; for the day with Him signifyeth a thousand years; and this He himself beareth me witness, saying; Behold, the day of the Lord shall be as a thousand years. Therefore, children, in six days, that is in six thousand years, everything shall come to an end. And He rested on the seventh day. this He meaneth; when His Son shall come, and shall abolish the time of the Lawless One, and shall judge the ungodly, and shall change the sun and the moon and the stars, then shall he truly rest on the seventh day. Epistle of Barnabas 15:1-5. Heliocentric model and Geocentric Model. It’s no good saying that the earth was created under 6000 years ago without having a working Calendar demonstrating that fact. Here I give the biblical geocentric model and the Heliocentric models over views of their mechanics. “And I heard another voice from heaven, saying, Come out of her, my people, that ye be not partakers of her sins, and that ye receive not of her plagues”. This call “come out of her” comes from God calling His people out. That is what Church means called out ones. Click here for a detailed study on the true church. Not a building made with hands. It’s the people called out and set apart. That’s also what holy means set apart. So God calls us out into himself through the messiah the lord Jesus Christ and the Holy Spirit and sets us apart. Out of the world and all its ways into Him. We are living in the last time and many voices have come and gone into the world. Who are we listening to man or God? The only place of safety is in the Ark of the messiah the lord Jesus Christ. Secular worldly religion is moving into apostasy deeper every day. She will be judged for it. But for now while grace abounds listen to God. Separate yourselves from among them. Meet together daily if you can not once a week. Encourage each other daily because the days are wicked lest we are tempted from the wickedness of this world and led astray. The Hovind Theory Video The Hovind Theory blends scientific observations with Scripture in a fascinating explanation of what ... all » caused Noah's Flood, the Ice Age, the formation of coal, mountain ranges, and the Grand Canyon. Dr. Hovind gives logical answers to the physical anomalies that geologists cannot explain with the evolutionary theory. CLICK HERE TO VIEW VIDEO. Giving scientific evidence to prove a literal six-day creation, Dr. Kent Hovind refutes evolution's proposition that the earth has evolved over billions of years. The first of seven in the seminar series, The Age of the Earth, uncovers the follies of the Big Bang theory as well as exposing the religious beliefs of evolution. CLICK HERE TO VIEW VIDEO. Questions and Answers, covers a variety of topics including radiometric dating and the speed of light in relation to star distance. In addition to "primitive man" and race origins, Dr. Hovind discusses the mark of the beast and supposed contradictions in the Bible. CLICK HERE TO VIEW VIDEO. Lies in the Textbooks Video In part four of the seminar series; Dr. Hovind shows how public school textbooks are permeated with fraudulent information in order to convince students that evolution is true. Lies in the Textbooks is a must-see for every public school student, CLICK HERE TO VIEW VIDEO. The Bible and Health Video Is it always God's will to heal us? The Bible has a lot to say about the subject of health. On this video, Dr Hovind interviews health experts who share some simple nutritional facts and Scriptural principles to improve our health. CLICK HERE TO VIEW VIDEO. Conspiracy theory of the Evolution theory. CLICK HERE TO VIEW VIDEO. The Garden of Eden, part two of the seminar series, describes the earth as it was before the worldwide flood. Dr. Hovind explains in detail all how it was possible for man to live over 900 years, for plants and animals to grow much larger than today, and for dinosaurs to thrive along with man CLICH HERE TO VIEW VIDEO.